Now you can flat surface wash without the worry of waste water runoff. These systems are designed to save water, protect the environment and comply with storm drain regulations. 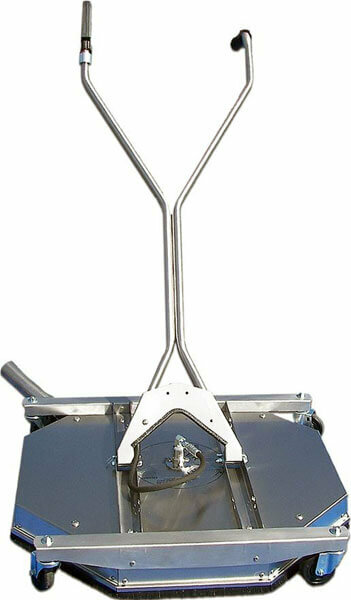 Suitable for use on greasy factory floors, concrete parking lots and drive thru areas, gas stations, garages and more. 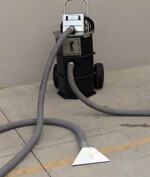 Capture and transfer up to 3000 gallons of water per hourwith the compact RPV vacuum system. 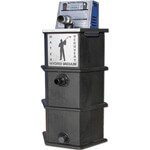 Features a powerful, industrial 2-stagevacuum motor. A heavy duty, stainless steel pump transfers wastewater up to100’ away while vacuuming continues…no need to stop and dump the collection tank. It is ideal for interior and exterior facilities maintenance contractors who need to collect wash water or for restoration contractors who need to pickup large volumes of water after a fire or flood. (for use with cold water or hot water up to 200 °F). Available WHEEL KIT/ DOLLY STYLE (AHS06) option, call to order. A unique tool that when combined with our RPVACE1 and RPT5E1 (see RPVACE1-K or RPT5E1-K for complete kit) and a pressure washer functions as a complete wash/recovery system. New vacuum ring design doubles the length of vacuum hose. Unique geometric shaped deck with a brush skirt reduces drag and keeps the deck from “sucking” to the ground. * Sorry, no free freight to Texas & Califormia. Please call 866-858-4982 for rates.